Creamy, cheesy and absolutely, positively addicting. If it’s never graced your table, you HAVE to make it, immediately! My aunt makes a version slightly different from this, but it always shows up at Easter and Christmas. Not surprisingly, cheesy potatoes go exceptionally well with ham dishes! I recently made this to go along with meatloaf for a Sunday dinner. We were a very small crowd that week and four adults polished off all but one row of this casserole. Granted, it was the only side dish we had, but still… we crushed it. We couldn’t stop taking just one more little scoop after another. So basically, you should be assured that this be a massive, massive hit whenever you make it. Hashbrown casserole is one of the most addicting side dishes you will ever eat! 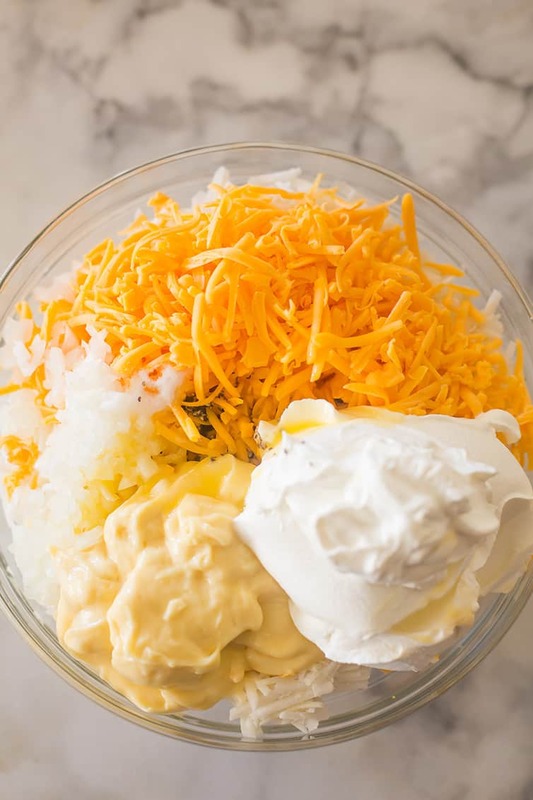 It’s an easy casserole that takes less than 10 minutes to mix together – simply stir together thawed hash browns, butter, cream of chicken soup, sour cream, chopped onion, shredded cheddar cheese, salt and pepper, pour it into a casserole dish and pop it in the oven! 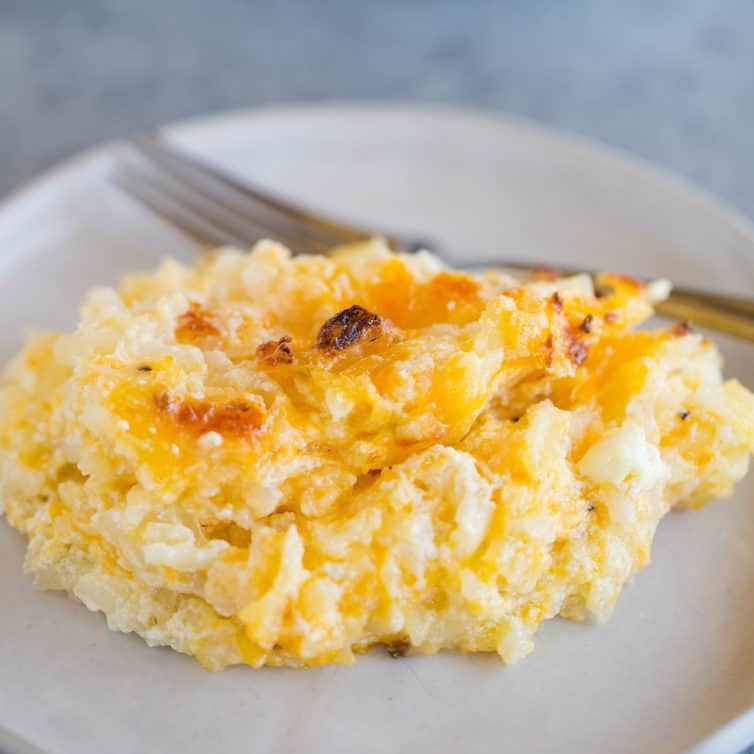 Some consider this a copycat of the Cracker Barrel hashbrown casserole; I’ve never tasted it, but my husband confirmed that it tastes very similar. So if you’re a fan of that, you’ll love this recipe! 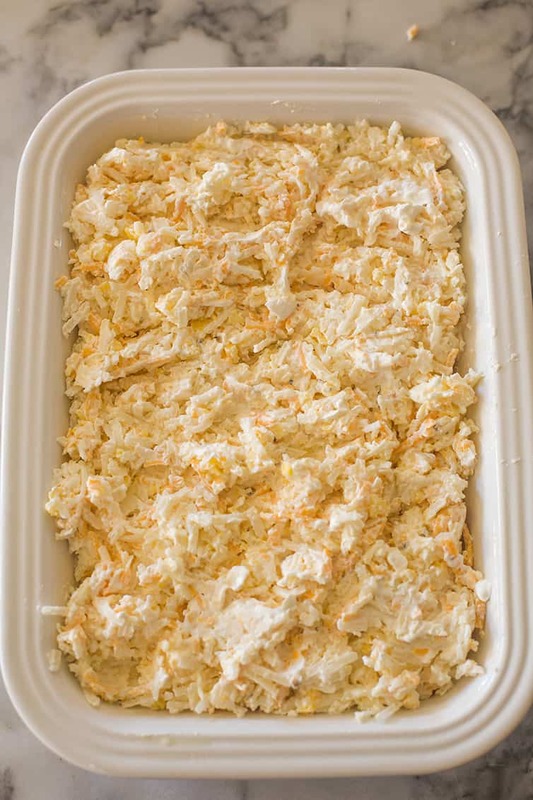 It’s also a cousin to the cheesy potato casserole with Cornflake topping that I made a couple of years ago; many people refer to that particular recipe as “funeral potatoes”. Do You Have to Thaw the Hash Browns? In a word, yes. Using totally frozen hash browns will cause the dish to take quite a long time to bake and it won’t brown and bubble up as nicely. If you didn’t allow enough time to thaw them per the package instructions, you can always microwave them; just be sure to drain before adding to the recipe. 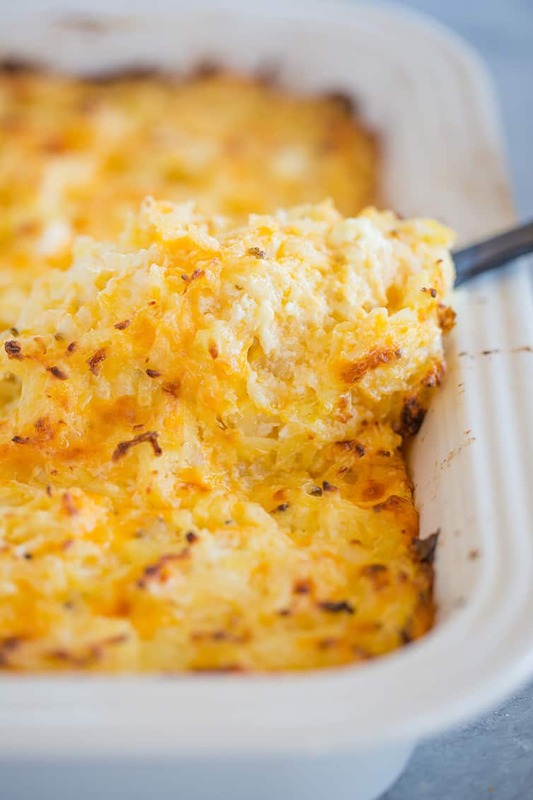 Want to make this hashbrown casserole without the condensed soup? Check out the recipe from The Chunky Chef. This casserole would lend itself to tons of modifications based on personal preferences – add bell peppers, ham, sausage, bacon, broccoli… so many options! Looking for a crockpot hashbrown casserole? I have one! The Slow Cooker Sausage, Hash Brown & Cheddar Breakfast Casserole is a huge favorite, especially for holiday mornings! You can freeze the hashbrown casserole, either before baking it or after it has been baked and cooled. Cover tightly with plastic wrap and foil and freeze for up to 3 months. Thaw in the refrigerator before baking or reheating in the oven. 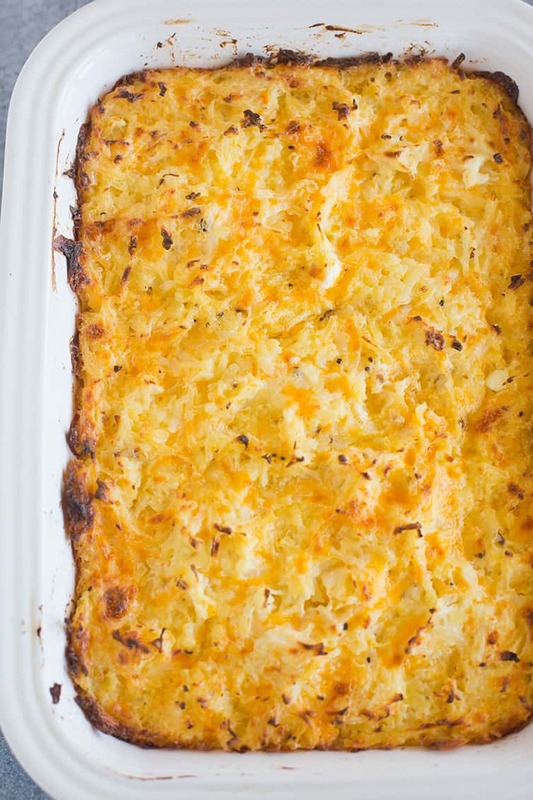 If you’re short on ideas for Easter side dishes, you won’t find one easier or more delicious than this hashbrown casserole. Then, tuck it away for Christmas or any other gathering casual gathering when you want to make a big hit, because I guarantee that this will be the first thing to disappear every single time! 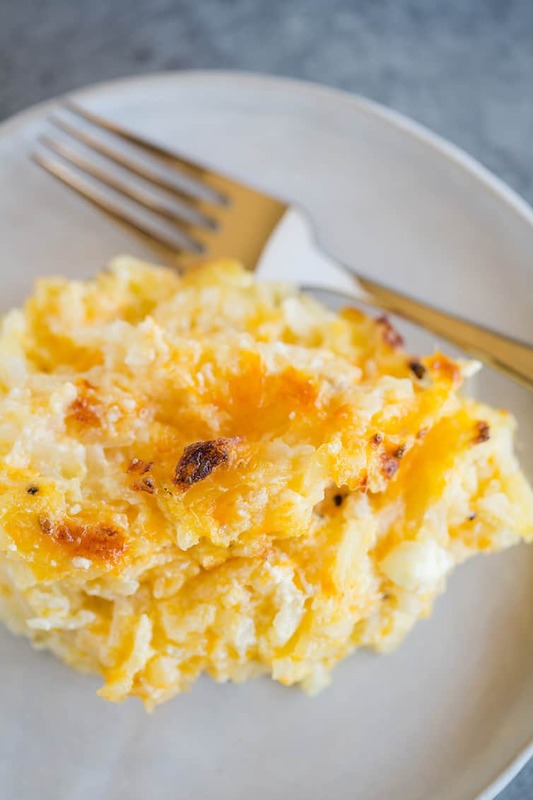 This easy, cheesy hashbrown casserole takes only minutes to throw together, and is a favorite side dish for holiday dinners from Easter to Christmas and casual weeknight dinners alike. Total comfort food! In a large bowl, stir together all of the ingredients until thoroughly combined. Pour into prepared baking dish and bake until golden brown and bubbling, 30 to 45 minutes. Let rest for 10 minutes before serving. This casserole would lend itself to tons of modifications based on personal preferences - add bell peppers, ham, sausage, bacon, broccoli... so many options! 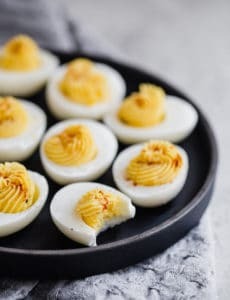 I made this for Easter breakfast and it was a huge hit! We almost didn’t want to leave leftovers for the next day. I did use cubed hashbrown instead as that’s what I had at the time. I’ll definitely be making this again for family. Your recipe is very good and will be my go to recipe for this casserole. I tried the ultimate hash brown from Chunky Chef (your suggestion for recipe that doesn’t use canned soups). I followed recipe exactly and used a 10” iron skillet It was a disaster. It ran over in my oven and was a mushy mess. I sent comments and ask for suggestions from blogger two times but received no response. You may want to consider this in recommending that recipe on your site. This really isn’t a review but am just wondering instead of making in a 9 x 13 – could we maybe do in two smaller dishes – freeze one and bake the other. There will be only 4 of us for Christmas brunch – thought the other could do for New Year’s brunch. Oh gosh, do I make this a TON! 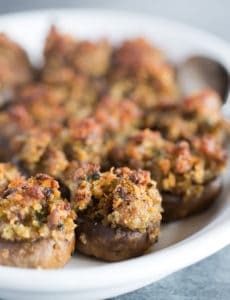 So easy, so yummy and my family gobbles it up.. The only change I make is I use the frozen Southern Style Potatoes O’Brien (that already have the peppers and onions in them), then I just eliminate the chopped onions. It’s one easier step and my family likes the additional flavor it adds. I know of no cream of chicken soup to be able to use, Campbell’s has MSG, which I’m seriously allergic to, Pacific brand cream of chicken is the nastiest thing to com along in years, too “floury” and way too much salt, Can’t use bullion cubes (MSG), so what’s left to provide the taste? Making homemade cream of chicken soup could be done, but would defeat the purpose, add a lot of extra time and cost to the recipe and chicken broth would bring the taste down quite a lot. Any suggestions? Hi Susanna, Unfortunately I’m not sure of a substitute other than making it homemade. You could try the brand you said tastes horrible; you might not notice if it’s mixed in with other things. I make this all the time. I sometimes add boursin for a little more flavor. What kind of hashbrowns? The square cubed kind of are they the shredded/grated style hash brown? Hi Kerry, The shredded hash browns. Enjoy! I used the cubed hash browns and it was a huge hit! I’m wondering the best temperature and time length for reheating a precooked, defrosted one? Thanks! Thanks, Erica for your comments about using cubed hash browns in the potato casserole. We cannot buy shredded hash browns any more in Canada, and I have missed making this sort of casserole. I will try this one! I signed up to bring a main dish to a pot luck dinner. I had planned on making this dish, but realized I needed meat, so I decided to add cooked, cubed chicken. It was so goosd. I got a lot of compliments. Easy and delicious works for me. I make mine with chopped hot Hatch green chile. Delish! Can I put all of this together the night before & then bake in the morning? This one is perfect for Easter and i love the way u portrayed this dish through pictures. Richness of hash brown made this exquisite. This now added in my cookbook. I absolutely LOVE every recipe I have used from your website. Thank you!! Aw you’re welcome Cristina, so awesome to hear! Made these last night to accompany a smoke d chicken. They we’re so good that I ate way more potatoes than chicken. Thank you for a wonderful recipe.eI Have the Easter Pie In The Oven. These potatoes are a family favorite – we call then Nana’s Potatoes after my Aunt Naomi who first made them. This has been a summer porch party staple as well as a holiday go-to. And yes, always the first pan to empty and no leftovers! 😧 A fave for sure! – Put the package in the refrigerator overnight. – Put the frozen hash browns in a large bowl, cover, and let sit at room temperature for about 45 minutes (be sure to drain any liquid). – If you’re short on time, put them in a bowl, cover and microwave until thawed (again, be sure to drain any accumulated liquid). I have made a similar version for years. My recipe calls for 2 cans of soup as well as a small can of mushroom pieces and stems ( which I omit, not a mushroom fan), otherwise is the same. Like you said, always a favorite. This recipe is similar to one my sister makes. Her is called Swartzies. She uses cream of mushroom soup instead of cream of chicken soup. She also covers the casserole with a layer of shredded Parmesan and then bakes it until the Parmesan is dark and crispy on top. Super yummy! I have always loved cream of mushroom soup, so I definitely want to try this version, and a big layer of Parmesan on top? Totally up my alley! My husband’s family makes this for Christmas/Easter/any party really. They call them party potatoes and make them with cream of celery soup….I love them! 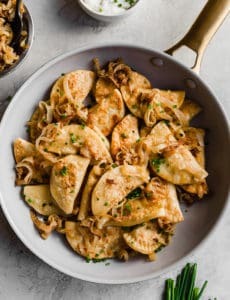 Love the twist with cream of celery, plus that would keep it vegetarian if you need to, great idea!